Tognetti, R., Lombardi, F., Lasserre, B., Cherubini, P. and Marchetti, M. 2014. Tree-ring stable isotopes reveal twentieth-century increases in water-use efficiency of Fagus sylvatica and Nothofagus spp. in Italian and Chilean mountains. PLOS ONE 9: e113136. Introducing their enlightening study, Tognetti et al. (2014) state that variation in intrinsic water-use efficiency (iWUE) -- the ratio between photosynthetic rate and stomatal conductance -- "is recorded in the variation of the carbon isotope discrimination (Δ13C) of the annual growth rings that are laid down during each growing season," citing the work of Duquesnay et al. 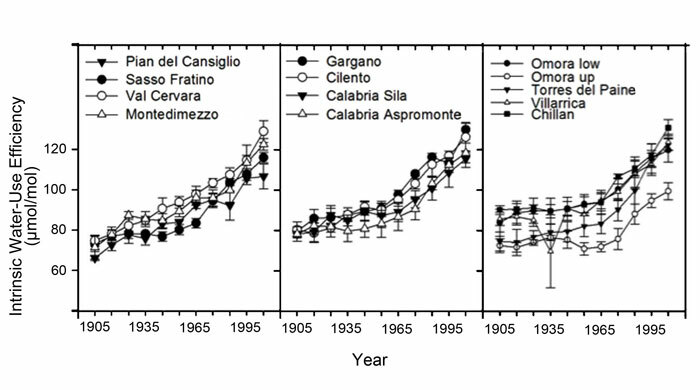 (1998); and they additionally note, in this regard, that "elevated atmospheric CO2 concentration (Ca) is expected to reduce stomatal openings and increase assimilation rates," as has been demonstrated by the work of Tognetti et al. (1998, 1999), which changes, in their words, "can alter the Ca to intercellular CO2 concentration (Ci) gradient and result in increased iWUE in the long-term, which will be recorded in the variation of this Δ13C." So to obtain these data, as well as to develop an independent means of assessing tree growth, the five researchers used large-diameter borers to extract two increment cores at breast height from each of 16-20 dominant trees at eight sites in Italy and five sites in Chile. And what did they thereby learn? They say that for both sets of beech trees, "a continuous enhancement in isotope-derived iWUE was observed throughout the twentieth century," which finding, as they go on to say, "was common to all sites and related to changes in ambient CO2 concentration and secondarily to increases in temperature." More specifically, they write that "over the twentieth century, the iWUE increased 35.3 ± 1.4% in the sites of Southern Italy and 39.8 ± 1.3% in those of North-Central Italy" (see figure below), both of which sets of results are in good agreement with the 44% increase reported by Duquesnay et al. (1998) and Peñuelas et al. (2008). Decadal mean variation in intrinsic water-use efficiency of Fagus sylvatica and Nothofagus trees growing at the eight Italian and five Chilean sites over the period 1900-2010. Adapted from Tognetti et al. (2014). Duquesnay, A., Breda, N., Stievenard, M. and Dupouey, J.L. 1998. Changes of tree-ring δ13C and water-use efficiency of beech (Fagus sylvatica L.) in north-eastern France during the past century. Plant, Cell and Environment 21: 565-572. Peñuelas, J., Hunt, J.M., Ogaya, R. and Jump, A.S. 2008. Twentieth century changes of tree-ring δ13C at the southern range-edge of Fagus sylvatica: increasing water use efficiency does not avoid the growth decline induced by warming at low altitudes. Global Change Biology 14: 1076-1088. Tognetti, R., Johnson, J.D., Michelozzi, M. and Raschi, A. 1998. Response of foliar metabolism in mature trees of Quercus pubescens and Quercus ilex to long-term elevated CO2. Environmental and Experimental Botany 39: 233-245. Tognetti, R., Longobucco, A., Miglietta, F. and Raschi, A. 1999. Water relations, stomatal response and transpiration of Quercus pubescens trees during summer in a Mediterranean carbon dioxide spring. Tree Physiology 19: 261-270.